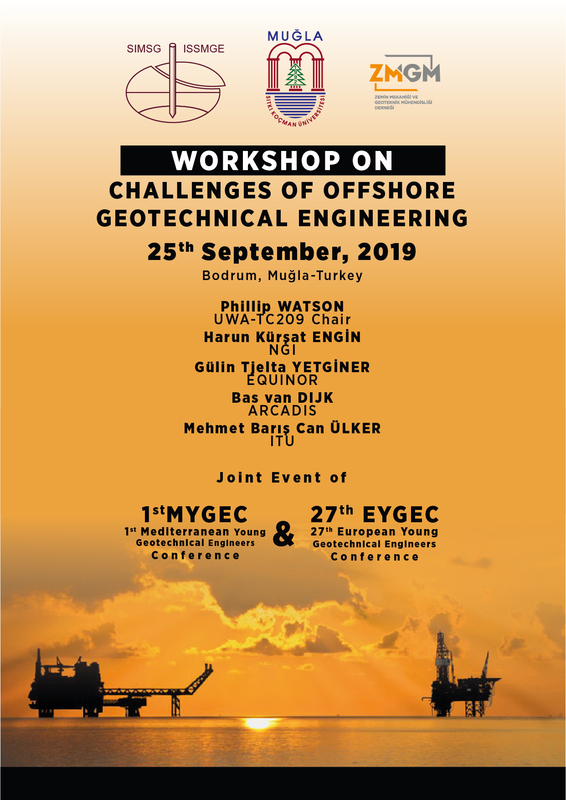 It is my pleasure to invite you to the Workshop on “Challenges of Offshore Geotechnical Engineering” which will be organized by Civil Engineering Department of Muğla Sıtkı Koçman University under the auspices of Turkish Geotechnical Society and ISSMGE. 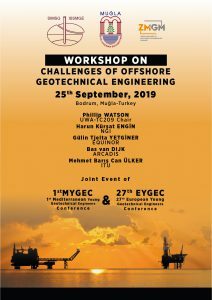 The workshop will be organized on 25th September, 2019, between joint events of 1st Mediterranean Young Geotechnical Engineers Conference (http://www.mygec2019.org/workshop) and 27th European Young Geotechnical Engineers Conference (http://www.eygec2019.org/workshop) will be held on 23-24th and 26-27th September 2019 at Kefaluka Resort Hotel (http://www.kefaluka.com) Bodrum, Muğla, Turkey. For the EYGEC & MYGEC participants workshop will be free. If you will only attend the workshop, the fee is 80€. Number of participants to the workshop is limited. You can send e-mail (gizem@motto.tc) for registration to the workshop. It is a great joy to invite you to attend the workshop. Your experience and enthusiasm in this field of work will incorporate invaluable contribution. We look forward to welcoming you to Bodrum in September 2019. We kindly ask you to make the announcement of the conferences and this workshop event to your colleagues. Please find the attached EYGEC&MYGEC Event Brochure and Workshop Poster.